I’m not sure what his nickname is, but the New York Islanders may want to start calling Thomas Greiss Batman since Robin is the other half of the team’s dynamic duo in net. Greiss and Robin Lehner have been top notch this season as the Islanders are now a legitimate contender for first place in the NHL’s Metropolitan Division. The squad took over top spot in the division recently with a 2-0 away victory over the Washington Capitals on Jan. 18th. The game represented head coach Barry Trotz’s return to Washington, where he led the franchise to its first ever Stanley Cup last year. It was also the Islanders’ sixth consecutive road triumph. With a 3-0 win over the Anaheim Ducks two days later they’ve now won five straight overall while winning 12 of their past 14 outings. The 32-year-old Greiss of Fussen, Germany posted the shutout over Washington while fellow NHL journeyman Lehner posted the clean sheet against Anaheim. They’ve been a major reason for the Islanders’ success this year. Both goalies were top-10 in the league when it came to save percentage and goals-against average as Greiss was 92.0 and 2.50 and Lehner at 93.0 and 2.02 respectively. Lehner was ranked first in GAA and second in save percentage while Greiss was tied for ninth in GAA and eighth in save percentage. Each netminder had played in 26 games with a pair of shutouts and 14 wins for with Greiss and 15 wins and three shutouts for Lehner. The 27-year-old Lehner of Gothenburg, Sweden made the headlines for other reasons last year as a member of the Buffalo Sabres when he admitted to struggling with mental health issues. He wrote an article which stated he was diagnosed with bipolar, post traumatic stress, and attention deficit hyperactivity disorders. He was also battling depression and suicidal thoughts and was hooked on sleeping pills and alcohol. Lehner entered a rehab facility in Arizona during the offseason to exorcise his demons and is now playing his first NHL season as a clear-minded, sober player. The netminder was drafted 46th overall by Ottawa in 2009 and played in the Canadian capital from 2010 to 2015 when he was traded to Buffalo. He then signed as a free agent with the Islanders after three seasons with the Sabres. Entering 2018/19, Lehner had played 219 regular season NHL games with a record of 72-97-35 while posting a 2.82 GAA and 91.5 save percentage. High expectations were attached to the young man after being named the MVP of the 2010/11 AHL playoffs when he led the Binghamton Senators to the Calder Cup championship. However he was relegated to backup duty in Ottawa and never played more than 36 games in a season there. He was number one in Buffalo the past two seasons though, but his career never really got on track due to the weak team in front of him and his off-ice problems. Lehner decided a change of scenery was in order and inked a year-long deal with the Islanders last summer for just $1.5 million. 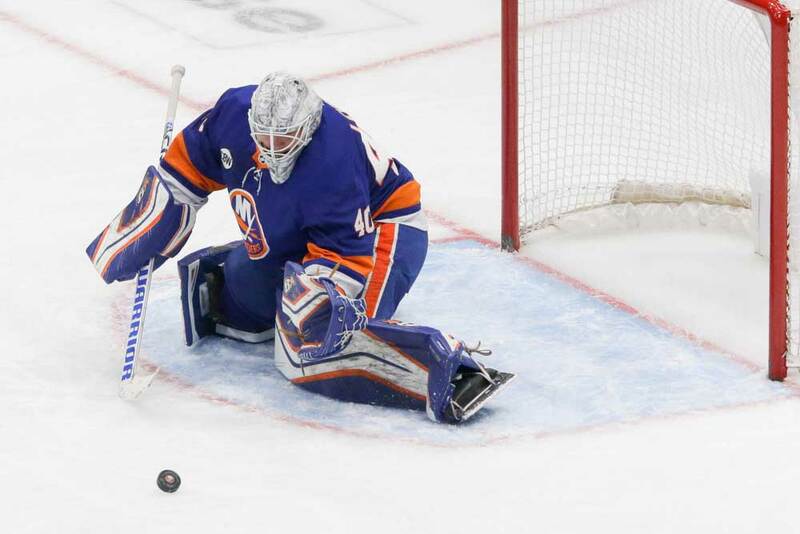 He’s turned out to be a bargain already and kicked off his career in New York by becoming the first goalie in franchise history to shut out the opposition in his team debut. As for Greiss, he was chosen 94th overall in the 2004 draft by the San Jose Sharks. He spent most of his time in the AHL with Worcester between 2006 and 2013 and appeared in just 44 games with the Sharks in parts of four seasons. He played well enough when he got the call with a record of 17-16-3 with a 91.2 save percentage and 2.51 GAA. Greiss then played 25 games with the Arizona Coyotes in 2012/13 and 20 with the Pittsburgh Penguins in 2013/14 before signing as a free agent with the Islanders. He’s now in his fourth season with the team and has a career mark of 112-75-23 with a 2.66 GAA and 91.3 save percentage. Greiss and Lehner have been enjoying career years this season and the Islanders are leading the league in GAA at 2.49 with the league average at 3.03. Greiss signed a five-year extension in 2017 so general manager Lou Lamoriello doesn’t have to worry about him for awhile, but he’s going to have to give Lehner a decent-sized raise if he hopes to ink the pending free agent to another contract. The Islanders’ duo has allowed more than 50 goals fewer this season compared to the same juncture last year. In addition, at this point in 2017/18 they had the worst goals-against in the league and now own the best. There’s no doubt Greiss and Lehner deserve a lot of credit, but the rest of the team should also get props for buying into Trotz’s system during his first year with the club. The team has been scoring at close to three goals per game this season. This may surprise many since their former captain, leading scorer and franchise player John Tavares walked away from the side and inked a long-term deal with the Toronto Maple Leafs during the summer. The roof didn’t cave in as many had predicted though. The bleak outlook was somewhat understandable since the squad appeared to age overnight with the addition of Valtteri Filppula, Leo Komarov, Tom Kuhnhackl, Luca Sbisa and Matt Martin. When healthy, these veterans have pulled their weight though while forwards such as Mathew Barzal, Anders Lee, Josh Bailey, Brock Nelson and Jordan Eberle and been leading the their scoring parade. Also, youngsters Michael Dal Colle, Josh Ho-Sang and Devon Toews have all contributed as injury replacements. Let’s also give credit to the Islanders’ fourth line of Martin, Cal Clutterbuck and Casey Cizikas. They were an effective unit a few years ago before Martin signed as a free agent with Toronto. Lamoriello reacquired him in a trade last year and the hard-hitting trio has chipped in with its over 40 points and tons of energetic play. The Islanders conceded a league-worst 296 goals last season under former head coach Doug Weight which meant they typically had to score four of their own to win games. That’s not the case with Trotz behind the bench as they’re on pace for about 206 goals against this year. It’s obvious Trotz has implemented a more effective system and the team isn’t missing Tavares because of it. But even so, the duo of Greiss and Lehner are ultimately the ones stopping the puck when it matters the most and deserve all the credit they’re getting.